The award is aimed at driving the demand for recycled plastics through innovation and is open to both design and final product entries. It also provides the plastics recycling sector with the chance to show its commitment to the environment and saving resources through recycled materials. The winner of the award will be announced at a glittering awards dinner at the London Hilton on Friday 27 September 2019. 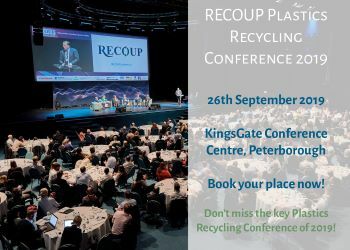 RECOUP chief executive Stuart Foster said: “We have been connected with this award since 2014 and remain committed to encouraging and promoting the use of recycled within plastics manufacturing. The awards provide an important platform to demonstrate that plastic is a circular resource. Consumers are now looking to manufacturers to be committed to more environmentally sustainable manufacturing.” The award is open for entries at www.recoup.org/brp2019, and the deadline is 31 May 2019.